After the Asus M70S and the M51SN, it is now time to test the M50S. 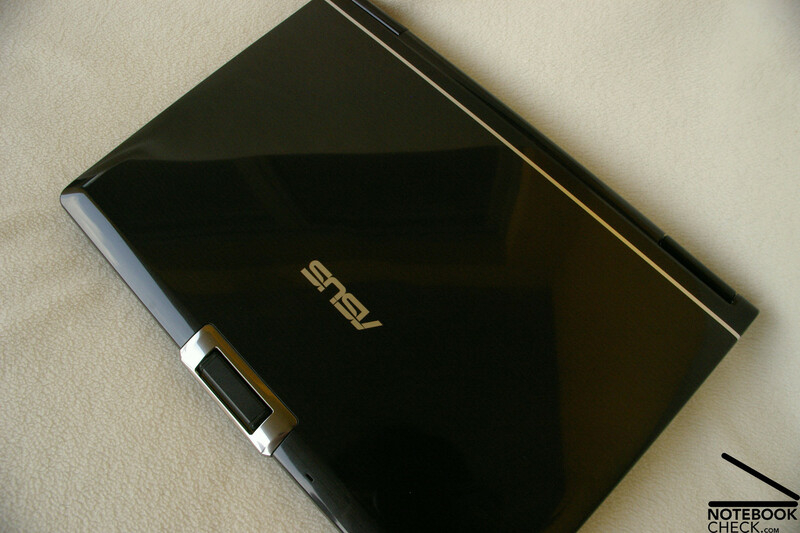 The M50S, like the other notebooks made by Asus, belongs to the segment of high performance multimedia notebooks. The hardware equipment and design of our 15" M50S test sample are very similar or even identical with that of the bigger M70S model. For example, both have a HDMI interface and a Blu-Ray drive. Asus put current hardware by Intel and ATI in our test sample. 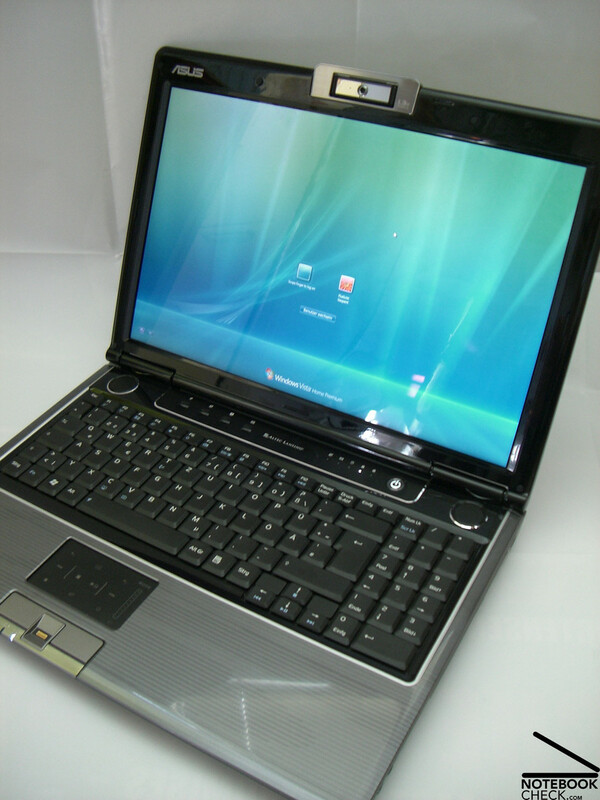 Responsible for sufficient performance is thus an Intel Core 2 Duo T9300 processor (Penryn core, 6MB L2-cache) with 2.54GHz and a HD 3650 GPU made by ATI. The package is topped off with 3GB DDR-2 RAM. 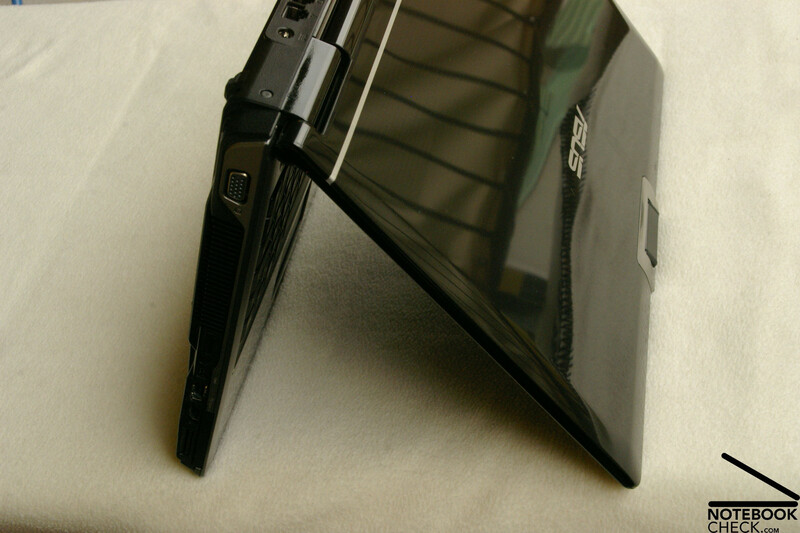 With a native resolution of 1680x1050 pixel, a Blu-Ray drive, and a HDMI, as well as an eSATA port, the Asus M50S has everything which a modern multimedia notebook should offer nowadays. The M50S looks similar to the M70S model, which isn't surprising, since both notebooks belong to the same series. 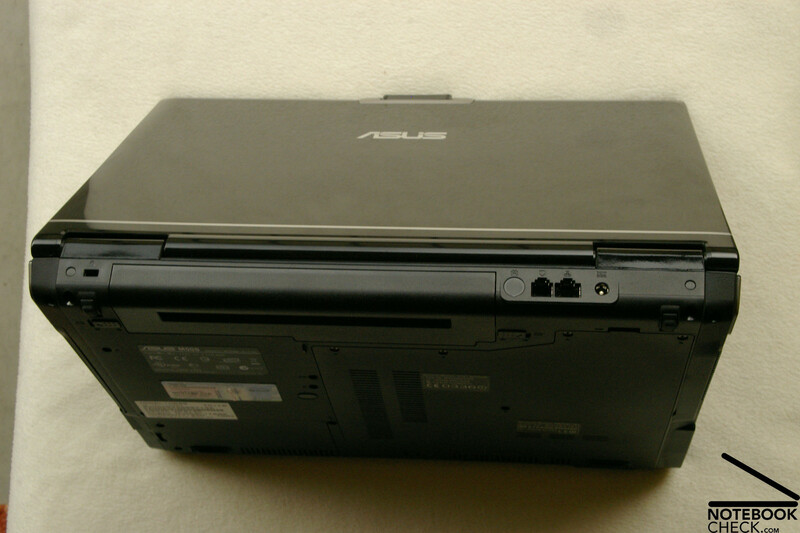 Asus used the same high quality finish for the M50S, as it used for the 17" M70S. 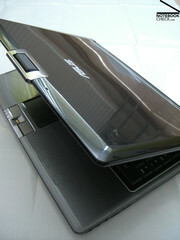 Additionally, the various chrome bars, glossy plastic parts, and line patterns, which Asus calls "Infusion", were used for the M50S multimedia notebook as well. The notebook with glossy finish and good colour choice, as well as appealing Infusion design, gives an attractive impression. Furthermore, the case of the Asus M50S not only looks good, but it also feels nice to the touch. Like with the M70S, the surface of the M50S seems to be resistant to dust and fingerprints, despite glossy finish. Although the case of the M50S is completely made of plastic parts, it offers impressive stability. It had hardly any problems with point pressure and showed only minor deformations. Handling the notebook showed similar results, with minimal or no creaky noises from the case. Lifting the notebook on the sides or front edges is not a problem either. As opposed to the M70S, we couldn't detect noticeable creaky noises when closing or opening the display that would lessen the good impression of the Asus M50S. Only the display's backside cannot keep up with the rest of the case in terms of stability. Deformations of the display lid are clearly visible if pressure is applied. Two hinges on the right and left side are responsible for the movement of the 15" display. They keep the display in position and prevent virtually any seesawing. While the M70S used a dual transport hook closing system to keep the display safely shut, the M50S model doesn't have a closing system at all, presumably due to its smaller display size. Despite this, the display stays safely shut and can easily be opened again. 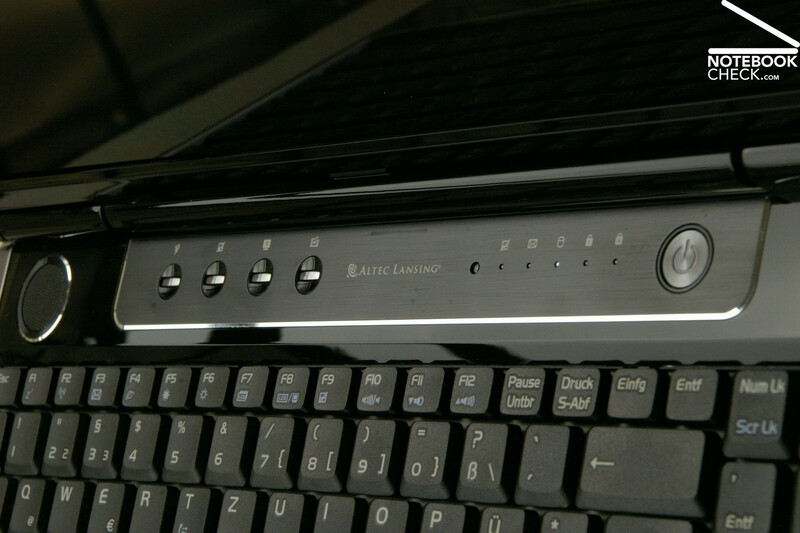 Asus distributed the interfaces of the M50S very user friendly. The front side is kept free of ports and connections, with the exception of the infrared port and a mechanical switch to turn on and off the WLAN and Bluetooth module. The extensive interface equipment is thus distributed over the remaining three sides. On the backside there are permanently used connections, like power supply and ports for LAN and modem. 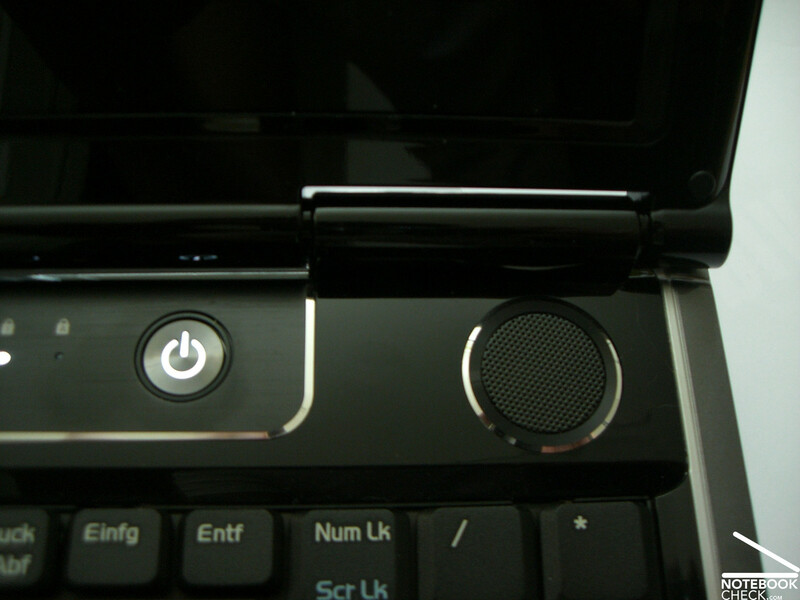 It is also possible to add a Kensington lock on the left of the battery slot. On the left side there is the analog standard VGA connection, as well as ports for Firewire, HDMI, and a card reader. Additionally, an eSATA port, which can also be used as an USB 2.0 port, is placed between Firewire and HDMI. The Blu-Ray drive uses most of the available space on the right side. On the right and left of it are three more USB 2.0 and audio ports (microphone, earphones, S/PDIF). Although the M70S had an Express Card slot on the right side, Asus didn't include one with the M50S, probably due to lack of space. A Gigabit LAN connection (Marvell Yukon 88E8055 PCI-E Gigabit Ethernet Controller) is responsible for a network connection over cable, while the Intel Wireless WiFi Link 4965AGN network adapter with Standard-n support provides wireless data exchange. Additionally, an infrared interface, Bluetooth, and an integrated modem (Motorola SM56) are built-in the Asus M50S. Furthermore, the notebook contains a rotatable 1.3 megapixel camera in the display frame and an integrated microphone directly next to it. Video communication with friends and relatives over the world wide web is thus not a problem for the M50S. In order to improve data security, the Asus M50S has a fingerprint reader integrated between the two touch pad keys. Instead of entering passwords manually, the user can simply touch the fingerprint scanner to gain access to password protected areas. 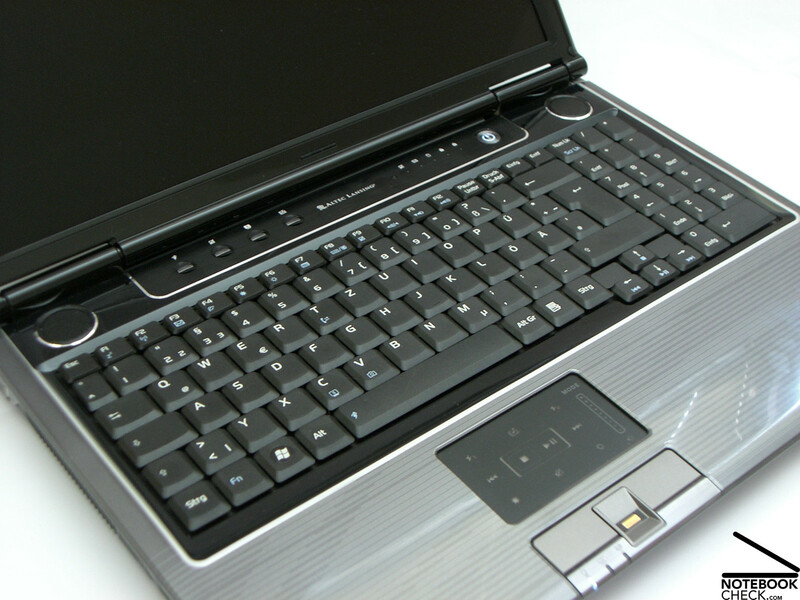 Even though the Asus M50S is a 15" notebook, it has a keyboard with a number pad. Because of this, the location of the keyboard is not exactly in the middle. Fortunately, the key size wasn't reduced because of the additional number pad. Thus, typing on the keyboard feels immediately familiar, without the need to get used to a new layout first. Typing on the M50S feels, similar to the M70S model, rather jerky with a clear pressure point. Apart from the expected clicking noise, the keyboard also emits a dull sound every time a key is pressed. This noise is acceptable under normal usage, but can get loud when typing more energetically. 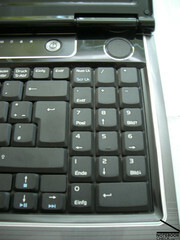 The touch pad is centrally aligned to the keyboard, and thus also slightly shifted to the left. The pad itself is a bit lower than the surrounding case, which causes the finger to constantly hit the border. On the other hand, the gliding characteristics of the touch pad surface are excellent. A feature of the Asus M50S, which was also present in the M70S, is the Dual-Mode function of the touch pad. 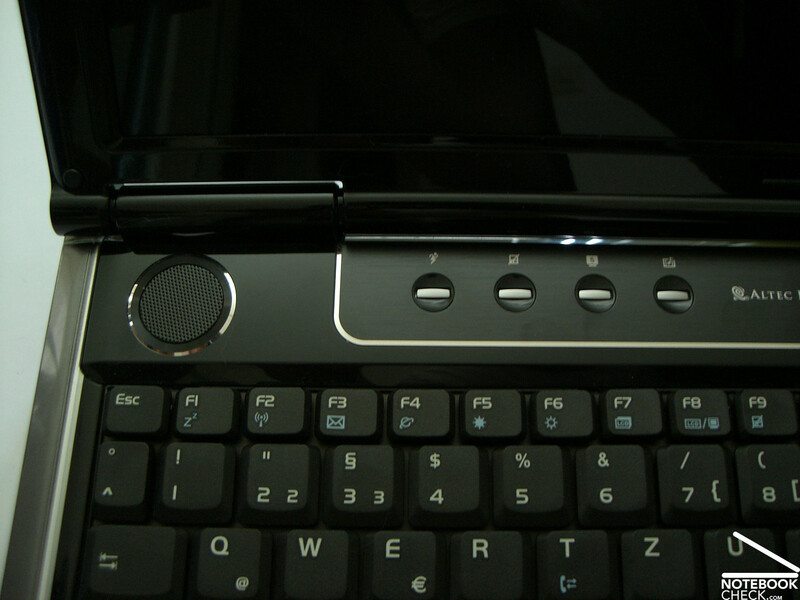 The user can switch between two modes by pressing the "Mode" button (right upper corner of the pad). The default mode allows obviously control of the mouse arrow. 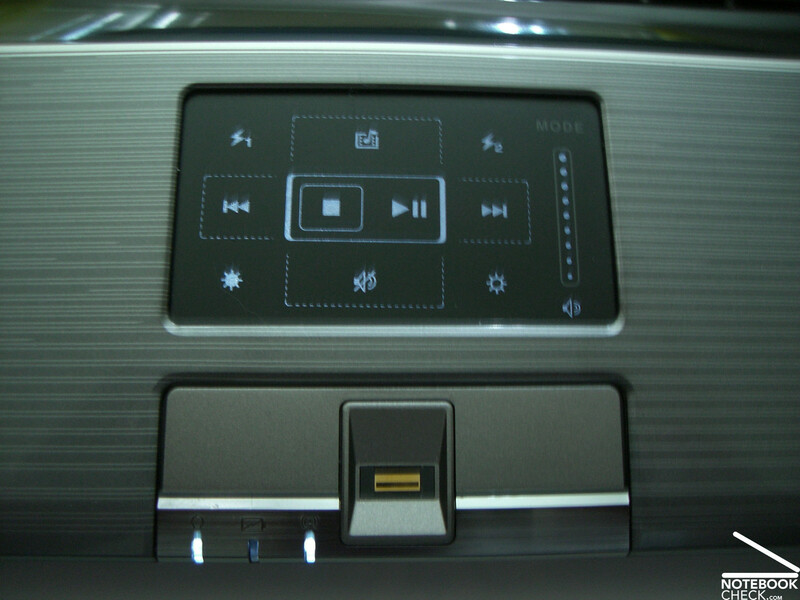 But switching to the second mode illuminates the touch pad and multimedia settings, like for example volume or the brightness of the display, can be changed by pressing the corresponding icons . 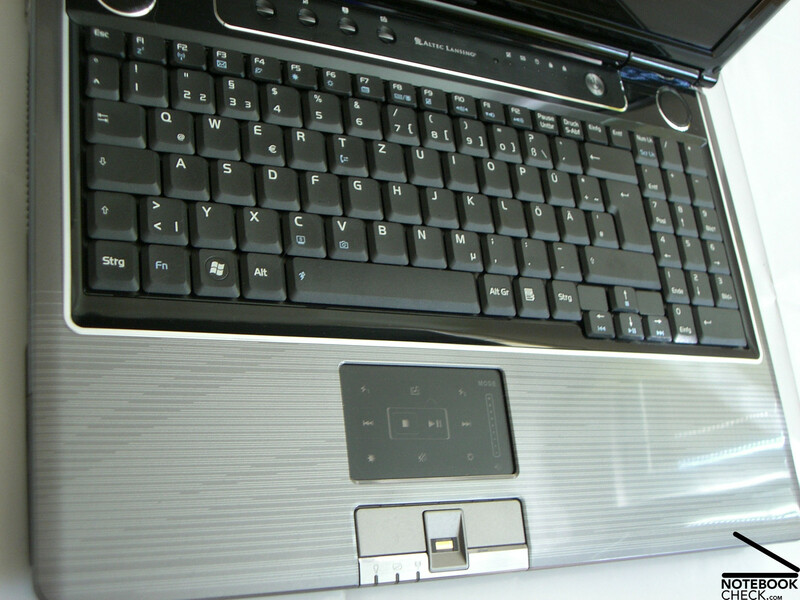 As usual for most Asus notebooks, the M50S offers additional hotkeys, which allow the user (from left to right) to change the energy mode, turn on or off the touch pad, switch between different display modes depending on application (theater, soft, film, automatic, etc...), or to directly access the Multimedia Center. 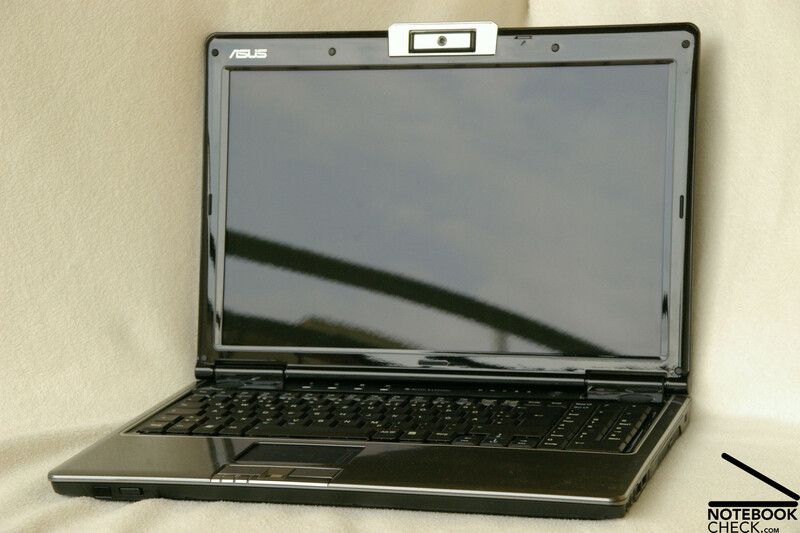 The multimedia notebook Asus M50S has a rather heavily reflecting 15.4" WSXGA+ LC display with a 16:10 aspect ratio and a native resolution of 1680x1050 pixel. This means it offers a much larger visible working space compared with standard WXGA displays, which facilitates working with multiple open windows or software with many toolboxes. An advantage of our test sample's glossy LCD is the subjectively strong and luscious colour display, which is especially noticeable while playing games. Furthermore, the test sample produced sharp and clear images and we didn't notice any afterglow on the display, even when playing fast paced games, like Crysis, Unreal Tournament 3, or Call of Duty 4. Like the M70S, the M50S contains a brightness sensor, which automatically adjusts the display brightness to the general environmental brightness. 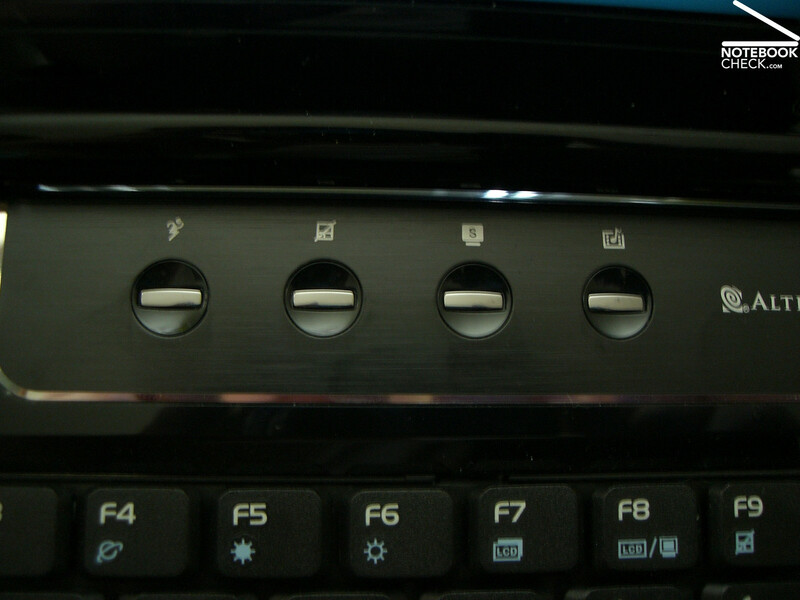 This feature can easily be turned on and off by pressing the key combination FN+A. The measured brightness and illumination of our test sample's display panel can be described as very satisfactory. With an average brightness of 201.4cd/m2 it definitively doesn't need to fear the competition. We measured the minimum brightness of 178.5cd/m2 in the lower left corner, which is still an acceptable value, while the maximum brightness of 222cd/m2 was achieved in the center of the display. Despite the good maximum brightness of the display, the Asus M50S notebook isn't really outdoor capable because of the glossy surface. Like with the M70S model, strong reflections have to be expected even indoors if the light conditions aren't optimal. Much better is the perspective stability of the display. Relatively flat viewing angles are possible in horizontal and vertical direction. A slight drop in contrast becomes noticeable if the viewing angle gets too flat, followed by stronger reflections. All in all, the available working space the display offers is more than sufficient. Similarly impressive is the hardware of the Asus M50S. Despite smaller 15" format, it has the same processor and graphics card as the larger 17" model M70S. 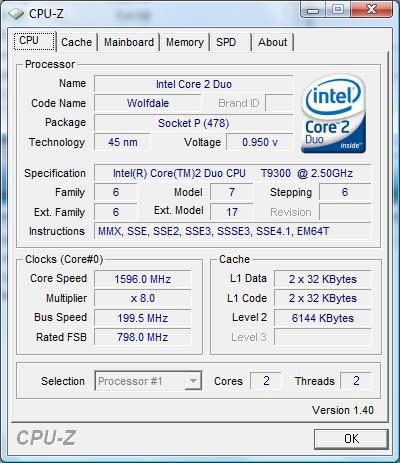 A glance under the hood reveals an Intel Core 2 Duo T9300 processor (Penryn) with 2.54GHz and a 6MB large L2-cache, as well as an ATI Radeon HD 3650 graphics card with 1024MB video memory. The package is topped off with 3GB DDR2 RAM (1x1GB and 1x2GB memory sticks). The results of our test sample in the 3DMark 05 and 06 weren't surprising. We didn't expect much difference to the M70S results, due to the almost identical hardware equipment of the M50S - an assumption that was confirmed in the test. 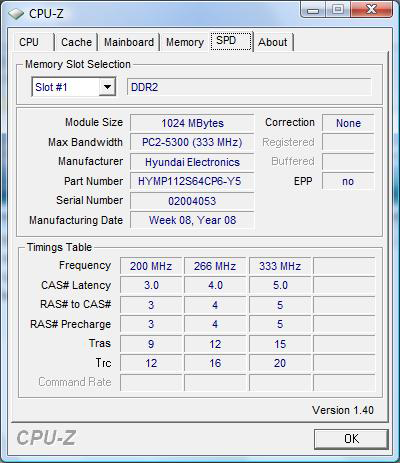 The 3DMark05 showed a virtually identical value of 7295 points for the M50S compared with 7270 points for the M70S. The 3DMark06 resulted in 3333 points for the M50S while the M70S achieved 3321 points. As the M70S before, the M50S didn't provide any useful results in the PCMark05 benchmark test. Both were delivered with the ATI driver version 7.14.10.0555, which seems to have problems with the PCMark05. The M50S, like the M70S, achieved very good rendering results in the Cinebench R10 benchmark test, due to the T9300 CPU. The same can be said about the results of the OpenGL shading test. 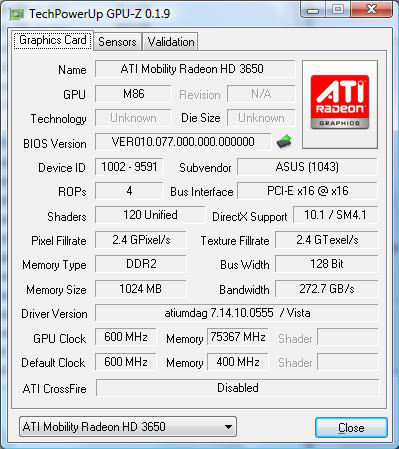 The ATI Radeon HD3650 thus doesn't need to fear the competing cards made by nVIDIA. 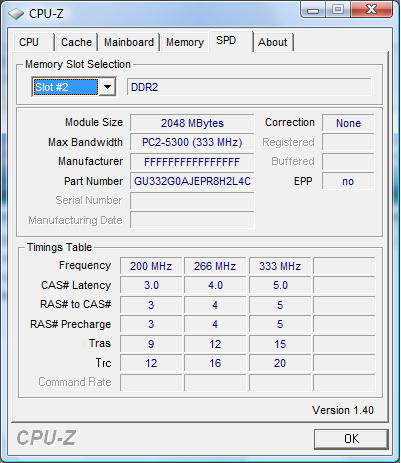 Asus uses a 320GB Hard disk made by Western Digital (WDC WD3200BEVT-22ZCT0) as mass storage for the M50S. WD's disk showed hardly any weaknesses in the HDTune benchmark test, and can easily keep up with the competition in the 5400r/min segment. Should the capacity be insufficient to store all data, it is always possible to add additional space by connecting portable hard disks to the eSATA port. The hard disk is thus average, without specific strengths or weaknesses . Of course we also tortured the M50S with games like Doom3, Unreal Tournament 3, Crysis, World in Conflict, Call of Duty 4, and Age of Conan. It became quickly clear that the Asus M50S is not specialised on games. 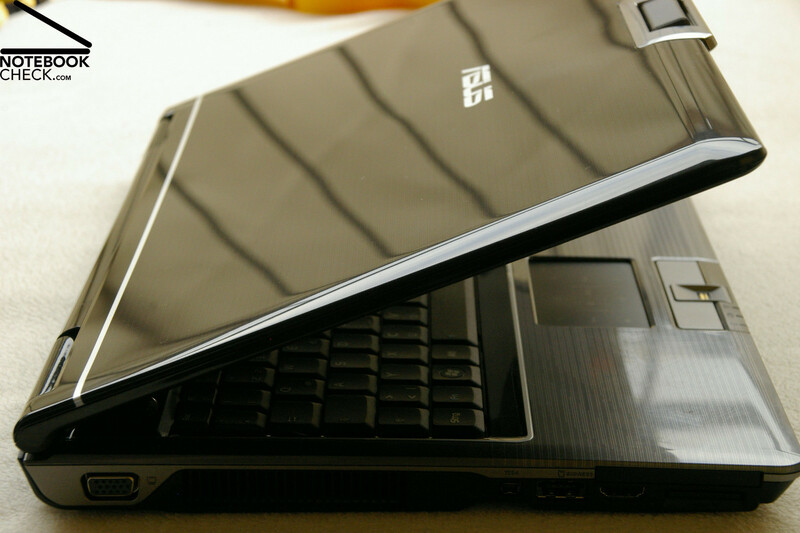 Those who are more demanding when it comes to gaming should consider the gaming notebooks made by Asus, like for example the Asus G70 with two nVIDIA 8700M GT graphics card in SLI mode. But back to our test sample, the M50S. We started the test with the slightly dated Doom 3. It ran in all detail levels, including Ultra details, smooth as silk with an average frame rate of 77,4 frames per second. Slightly different is the result with current games. The very demanding first person shooter Crysis was only smoothly playable with low details and a resolution of 1024x768 pixel at an average of 40 to 50 frames per second. An increase of the detail level to medium resulted in a big drop to rather jerky 15-20 fps. The real time strategy game World in Conflict ran smoothly with medium details (DirectX 9) in the performance test. With a resolution of 1024x768 it managed an average of 33 fps. An increase of the resolution to 1280x1024 lowered the average frame rate to barely playable 23 frames per second. Switching from medium to high details (DirectX 10) slowed the game to unplayable 10 fps, even with the resolution set back to 1024x768. Unreal Tournament 3 was smoothly playable with 55-60 fps at 1024x768. Although the Asus M50S managed 25-30 fps with a 1280x1024 resolution, it would frequently drop below 20 fps - usually a death sentence in a fast first person shooter like UT3. The frame rate dropped even more with the native resolution of 1680x1050. Strategy games are often still playable at 20-25 fps, but this value is rather useless in UT3. Call of Duty 4 also demands a great deal of the graphics card. It ran only with disappointing 14-21 frames per second with activated 4x AA and a resolution of 1024x768. However, once AA was deactivated, the game became very playable with 30-40 fps at the same resolution. Furthermore, we wanted to know how good or bad the graphically rather demanding MMORPG Age of Conan runs on the M50S. To our great surprise the notebook managed to run the game at its native resolution and medium details with smooth 30-40 fps. A respectable result. The Asus M50S is a very quiet notebook in idle mode. 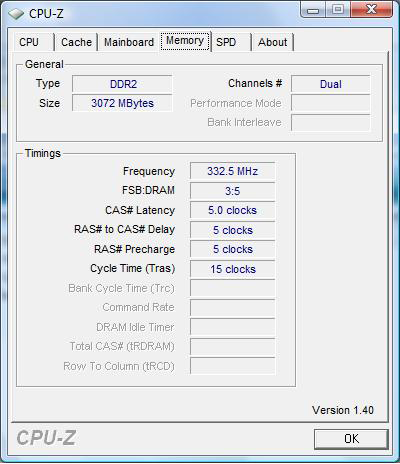 It is hardly audible with only 32.5dB(A), and we couldn't always tell whether the fans were running or not. We measured a maximum noise level of 35.5dB(A) in idle mode. The fan turned on relatively late under load and increased its speed in several steps until it reached constant 40.1dB(A). The Asus M50S is thus much quieter than its bigger brother. During DVD replay we measured a still acceptable noise level of 39.9dB(A). Surface temperature of the M50S is very low. Although there wasn't anything to criticise about the temperatures of the M70S model, the Asus M50S actually achieves an even better result. Measured maximum values of 35.5° Celsius on the upper side and 36.8°C on the bottom side leave no room for criticism. The Altec Lansing label between the two with chrome borders surrounded speakers builds up high expectations, which are met by the speakers. The sound is clear and of high quality in both games and music replay. The maximum volume is sufficient too and doesn't leave anything to be desired. Unfortunately, the Asus M50S model doesn't contain an integrated subwoofer, most likely due to lack of space, which results in a rather weak bass. The Asus M50S contains a 4800mAh lithium-ion battery. This battery supplied our test sample in the BatteryEater readers test (maximum battery life and lowest energy consumption) for only 130 minutes with energy, a rather modest result. Not much different is the situation under load running the BatteryEater classic test (load, WLAN on, maximum brightness). The Asus M50S turned off after only 62 minutes. In the practical test, like for example DVD replay with deactivated WLAN and maximum brightness, it managed only 76 minutes. Not very satisfactory for a multimedia notebook if one assumes that movies take at least 90 minutes. We achieved a similarly disappointing 100 minutes in the WLAN mode with reduced brightness and activated battery saving mode. 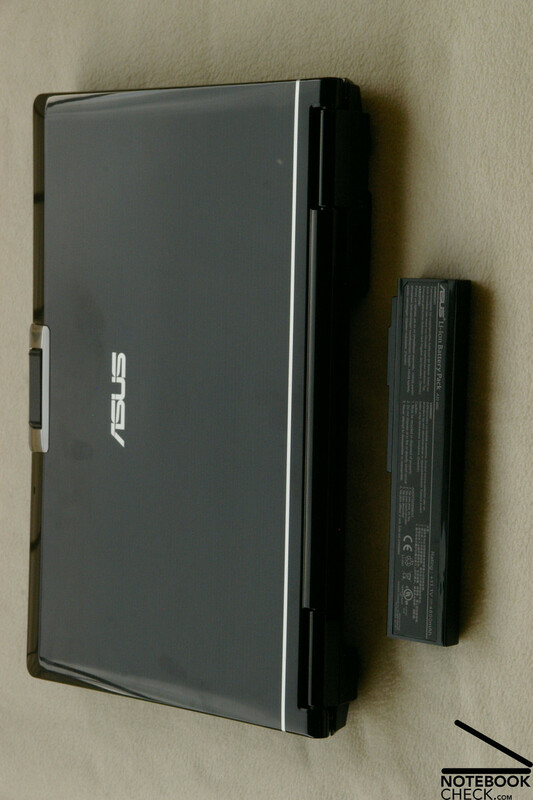 It becomes apparent that the built-in battery doesn't have enough capacity to turn the otherwise rather satisfactory Asus M50S notebook into a mobile work and multimedia station. The Asus M50S is not only attractive and elegant with its "Infusion" design, but also offers outstanding technical features. 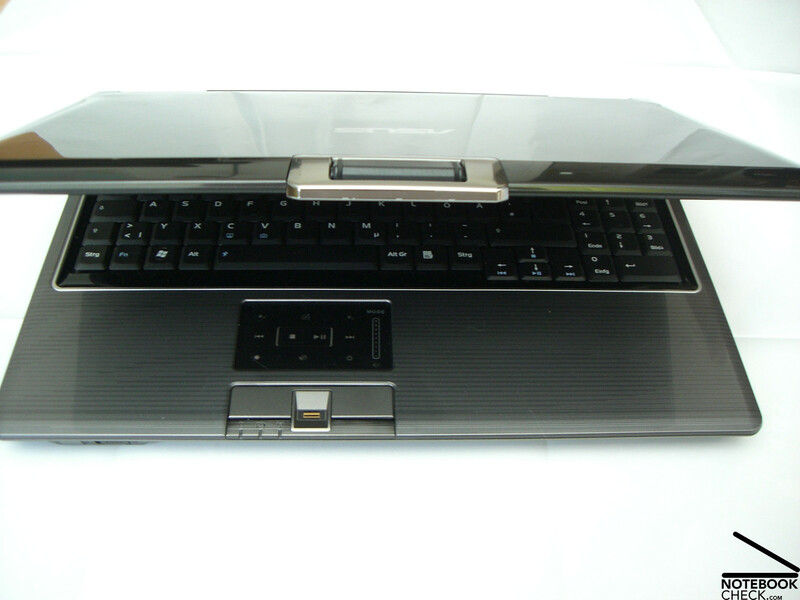 The stylish designed case with chrome and glossy surfaces is a proper frame for the extensive equipment of the notebook. Especially notable are the wide range of interfaces and their user-friendly alignment, which offer standard connections like USB 2.0, Firewire, LAN, and modem, as well as ports for HDMI and eSATA. Other features of the Asus M50S include fingerprint reader, Blu-Ray drive, integrated 1.3 megapixel webcam with microphone, and infrared interface. Not really essential, but nice to look at in dark rooms is the touch pad of the M50S with its two modes. 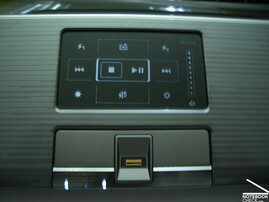 By pressing the "mode" button, the user can switch between default mode to control the mouse arrow, or the multimedia mode to adjust common multimedia settings. 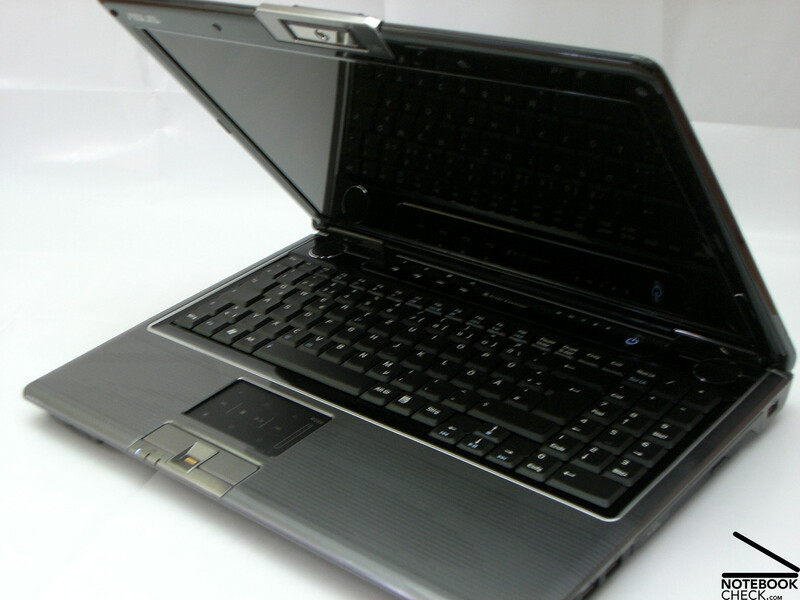 Asus equipped the M50S with a powerful Penryn processor with a 2.54GHz clock rate and 6MB L2-cache (Intel Core 2 Duo T9300), supported by a graphics card made by ATI, the Radeon HD3650 with a total of 1024MB video memory. The performance of the ATI graphics card is comparable with a GeForce 9500M GS, and thus not quite sufficient for good performance in current 3D games. 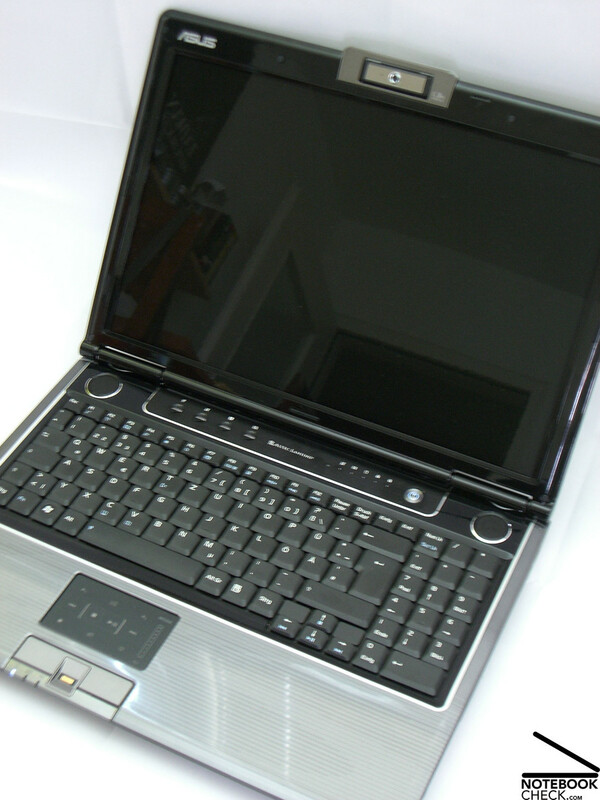 The package is topped off with 3GB DDR2 RAM. A big disadvantage of the M50S is definitively the barely existing mobility. Running out of battery while replaying a common DVD after only 76 minutes is not very impressive for a multimedia notebook. Not to mention Blu-Ray movie replay. 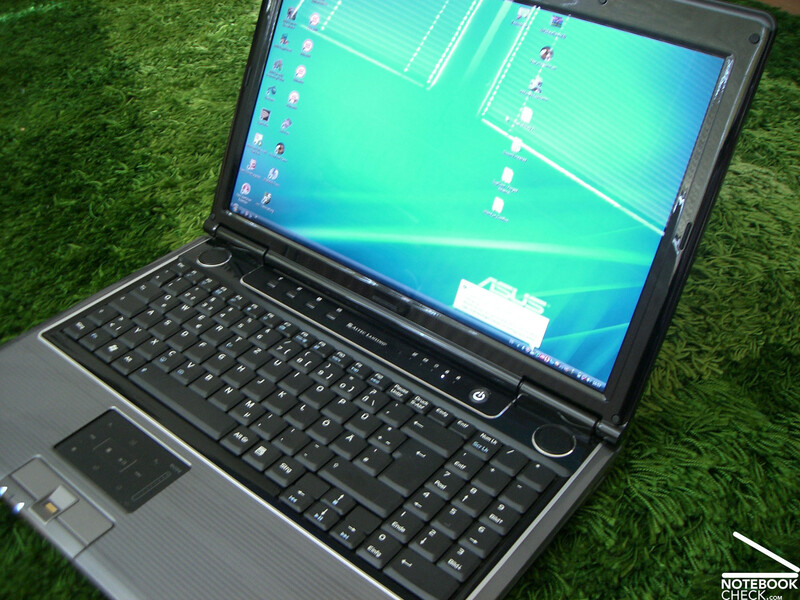 Even surfing the internet will deplete the battery within 100 minutes, which significantly limits mobile usage of the notebook. Unfortunately, the M50S isn't as generous as the M70S when it comes to included accessories. Asus added a high quality notebook carrying case and a small notebook mouse in the shipment. But the software package consists of a meagre driver and recovery DVD. The Asus M50S can mainly be recommended for multimedia users, who value a compact case but still want a display with a large working space. 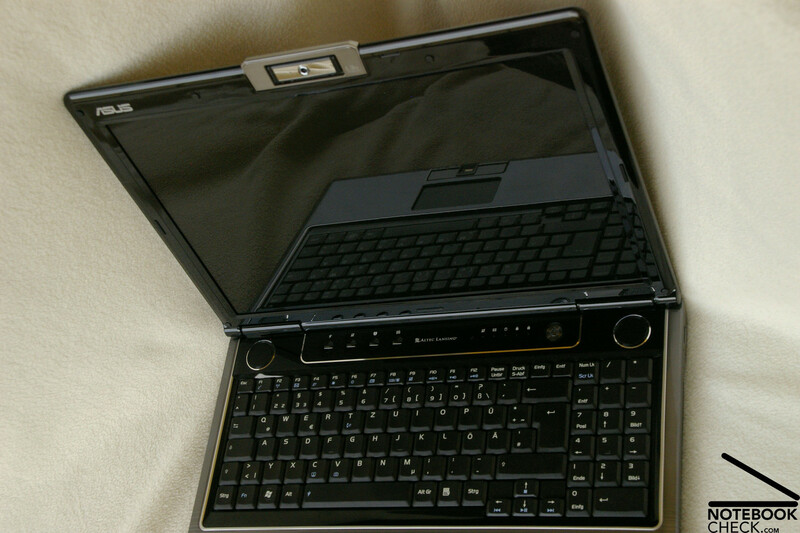 The notebook is also easy to transport from place to place, but it should be used near the mains, because the battery doesn't really allow much mobile usage. The only real disadvantage of the M50S is the very short battery life. due to its heavily reflecting display. 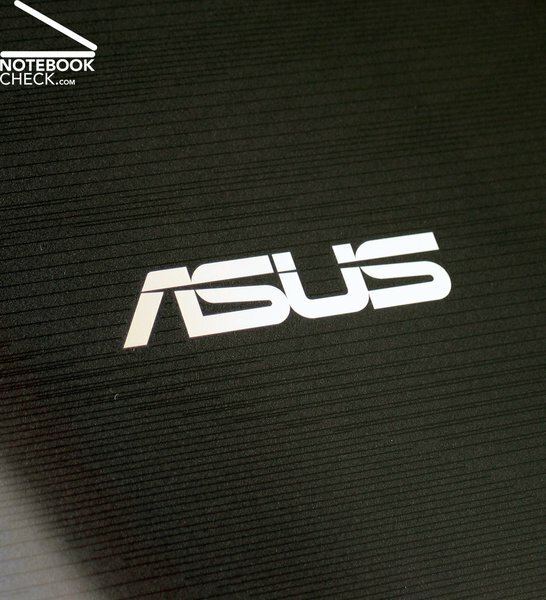 To summarize, the Asus M50S proved to be a well-engineered notebook.